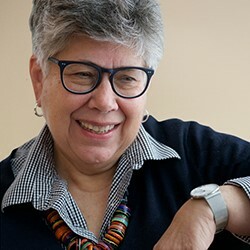 Linda Norris has been a leader for years in facilitating conversation and action surrounding the ways creativity can transform museums, shape more compelling narratives and create deeper, more inclusive community connections. She is the co-author of Creativity in Museum Practice and blogs atThe Uncataloged Museum. As the Global Networks Program Director, she leads the Coalition’s programmatic work in Asia, Africa, Russia, Latin America/Caribbean, Europe, North America, and the Middle East and North Africa, helping to build the capacity of these members through trainings and workshops, cross-regional exchanges and advocacy campaigns. Linda holds an M.A. in History Museum Studies from the Cooperstown Graduate Program, and has working relationships throughout the world. She was a U.S. Fulbright Scholar to Ukraine in 2009 and also served as a senior expert reporting on the state of Ukraine’s cultural heritage sector for the Culture and Creativity Project of the EU-Eastern Partnership Programme. In 2016 she facilitated a series of museum practice seminars in Latvia. In the United States and Canada, Linda has brought her curiosity and passion to transformative work with museums, historic sites, and other organizations and businesses. Her clients have included the American Association for State and Local History, a number of Coalition members, and other cultural organizations such as the Sir William Coaker Foundation in Newfoundland, Canada and the Akwesasne Cultural Center in New York. She has led teams in re-interpretation of historic sites and coordinated exhibition projects from concept to installation. Before establishing her consulting business, Linda was director of the Upstate History Alliance and the Delaware County Historical Association where her innovative, community-based work won state and national awards. Alongside her work at the Coalition, she will also serve as an adjunct instructor in the Johns Hopkins University’s online Museum Studies Program, teaching International Experiments in Community Engagement.